Previously on this blog, David Butler has considered the impact of club's moving stadium in the long term. I consider it again here, over the (very) short run. ​Recently, Tottenham Hotspurs moved into their new home and it is fair to say they have settled in quickly. At this stage the club have played just 3 games at the venue, but have a 100% record and are yet to concede a goal. 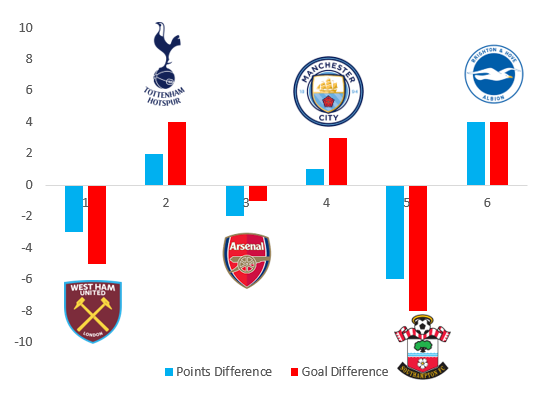 I had a quick look at a random sample of other Premier League clubs that moved stadium in the recent past to see how they fared both in terms of points and goal difference. The illustration below shows the difference in both, when comparing the final three league games at the old stadium, with the first three games at the new one. Of course, one of the Spurs games was a Champions League tie, but given that Manchester City were the opponents, I thought it fine to include. Spurs are certainly doing better than most. This might be because their new stadium is pretty much on the same site as White Hart Lane. Generally, when a club moves to a new stadium it involves a new location. The literature on home advantage is well-developed and it is surely helpful to players and fans that they have returned to familiar surroundings. It will be interesting to see if the North London club can sustain their excellent start as this season draws to a close. One year ago next week I wrote this. The piece tries to explain where the Video Assistant Referee (VAR) can be usefully deployed in football, and where it cannot. It's fair to say, the response to VAR has been mixed. It is very much debatable where the benefits of the system outweigh the (often) unintended consequences of using the technology. My original piece explains that in certain instances in football, video technology can help referees make better decisions. However, in some cases it is unhelpful. The crux of the issue is whether the rule of law is being interpreted objectively or subjectively. Tottenham vs Manchester City last night provides two perfect examples. VAR 1: Danny Rose's "handball". IFAB Laws of the Game state that handling the ball involves "a deliberate act of a player making contact with the ball with the hand or arm. The following must be considered: • the movement of the hand towards the ball (not the ball towards the hand) • the distance between the opponent and the ball (unexpected ball) • the position of the hand does not necessarily mean that there is an offence." Deciding whether or not Danny Rose's action last night was deliberate is purely subjective. Some may argue he made himself bigger. Others may suggest his hands were in a natural position for a defender making a last ditch tackle and that there was a short distance between Rose and Sterling. I don't believe it was a penalty, and more tellingly neither did the Man City players or staff. Not one opponent looked for a penalty. VAR 2: Heung Son-Min keeps the ball in play. The question put to the referee is simply did all of the ball cross all of the end-line. This is not subjective. The ball either did or didn't. Here VAR worked perfectly, just like it does in tennis and rugby. VAR is supposed to eliminate controversy, not cause it. It needs to be dropped in the case of VAR 1 and kept in the case of VAR 2. ​Referee's should decide if the ball was deliberately handled. That's what they are there for after all! Our 5th Annual Sports Economics Workshop will take place on Friday 24th of May 2019 in the Creative Zone of the Boole Library, University College Cork. The full programme is below. This event is free to attend but registration is required (see here). Tottenham & A Culture of Collapse - Fact or Fiction? Last weekend Tottenham gifted Liverpool a late own goal maintaining the momentum for the Premier League title race. As usual when these last gasp incidents happen the world of social media goes into overdrive. One of the more popular claims, that constantly reasserts itself, is that Tottenham have a proclivity to collapse and concede late goals. This view has crept into public perception – it is woven into Tottenham’s DNA to ‘bottle it’ and that this is a ‘cultural’ facet of the club. Mental strengths and resilience are often called into question. Let’s consider the evidence on late goals for and against Tottenham when the margins are tight, meaning that they shape the result. These are the late goals that matter as they swing the result when only a one goal margin between the teams exists. I define late goals as those from the 85th minute to the final whistle. Since the Premier League began Tottenham have been involved in 133 of these encounters where late goals changed the outcome. The facts are that 56 late incidents have gone against Tottenham (where they conceded) but 77 have gone in their favour (where they scored). The first table shows the breakdown of the 56 times Spurs went from winning to drawing (2 points dropped), drawing to losing (1 pointed dropped) and winning to losing (3 points dropped). Since 1992 Tottenham have dropped 78 points late on – the one total turnaround was against Everton in 2012 when Steven Pienaar (90), and Nikica Jelavic (90+2) scored in the dying stages. Tottenham have a net gain of 52 late points over the history of the Premier League – perhaps the perennial bottlers tag is misplaced. Easy to recall incidents, like last weekend, will likely skew judgements and detract from the evidence that paints a bigger picture. It will be interesting to compare this to the other five clubs that have always participated in the competition. I return to data from Fantasy Premier League, used previously, to demonstrate player productivity and opportunity cost. It should be noted, that player values are not fixed, and do rise and fall as performance change. The pictures below present the most productive Fantasy Premier League team, as of 1st of April 2019, and the most expensive. Team 1 presents the highest scoring 15 players. Liverpool are represented by 5 players, Chelsea 4, Man City 2 and Everton, Spurs, Arsenal and Man United each have one player on the list. Jordan Pickford, at under £5 million pounds is the cheapest player in the squad, but the total costs in excess of £133m pounds and can therefore not be assembled with the budget of approx. £100m (depending on performance to date). The most expensive teams is then considered and presented below. This team costs more than £135 million. Unlike some previous years, there is a large degree of similarity between the 15 most expensive players and the 15 best performing. 1 Goalkeeper, 3 defenders, 4 midfielders, and all 3 strikers (total of 11) make both lists. The 4 players that could be considered as "under performing" based on their Fantasy Football price are David De Gea, Cesar Azplilcueta, Kyle Walker and Alexis Sanchez. It should be noted that Romela Lukaku has an identical price to that of ​Pierre-Emerick Aubameyang. Inspiration for this post comes from my friends at the University of Liverpool who should take credit for what appears below. I hope it does justice to their hunch that there may be a relationship between Football League position and the results from the 2016 United Kingdom European Union membership referendum. Where a city has more than one team, the average league position for all teams is reported. For example, in Greater London covers 11 teams (Arsenal, Chelsea, Crystal Palace, Fulham, Tottenham, West Ham, Brentford, QPR, Millwall, AFC Wimbledon and Charlton). 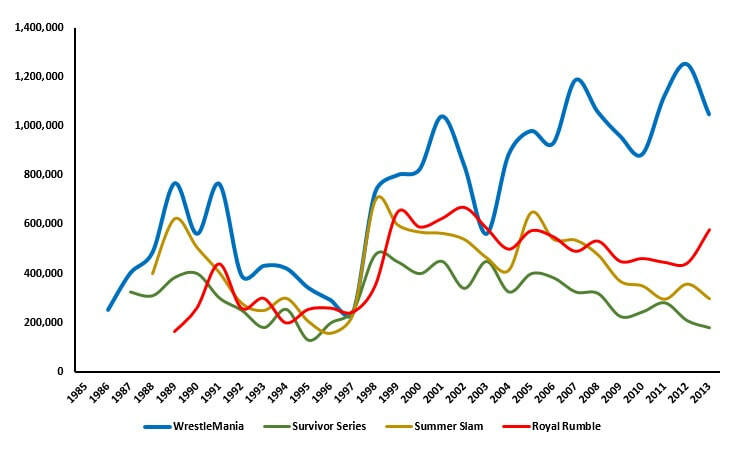 The y-axis measures current league position on a scale of 1 to 92. 92 corresponding to bottom of League Two. The x-axis measures the margin between Leave and Remain votes in the 2016 referendum. For example, Stoke-on-Trent reported the largest difference, where 69.4% of people voted to leave the EU and just 30.6% voted "remain". The margin is therefore -38.8%. At the other end of the spectrum, Brighton and Hove voted 68.8% (Remain) and 31.4% (Leave), the margin being 37.2%. As I have plotted the "Remain" option as positive (my implicit pro-EU bias), this means the greater the number of remain votes, the lower the league position. It is no surprise to see the strong remain urban centres of Liverpool, Manchester and Cardiff appear in the bottom right of the graph. Greater London is, on average, under performing but this is obviously an aggregate observation and should be treated as such. Bristol is the biggest under performing pro-EU city, largely because Bristol Rovers compete in the 3rd tier of English Football. 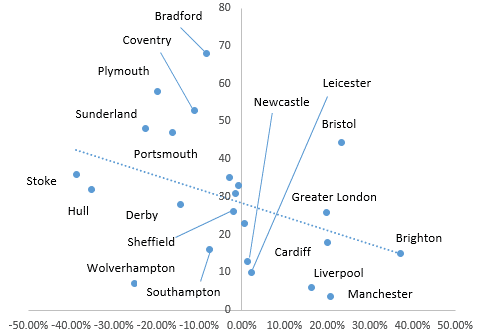 On the other side, pro-leave cities that are arguably doing better than one might expect include Wolverhampton, Southampton, Sheffield and Derby. Sunderland, Portsmouth, Plymouth, Coventry, Bradford and Stoke certainly support the view that leave voter come from places with football clubs that play in the lower tiers of English football. Of course, there are many reasons why this might be the case. I will explore these at a later date. I had the pleasure of lecturing the Thoroughbred Horseracing Industries MBA class at the University of Liverpool this week. We discussed funding horse racing in Ireland and the possible consequences of Brexit. The group came from a variety of industry stakeholders throughout these islands. At a general level, horse racing in Ireland is in relatively good health. According to Horse Racing Ireland (HRI), Irish bloodstock sold at public auction was to the value of €161.5m last year. While racecourse attendances continued to decline in 2018, large racing festivals are starting to attract record attendances again in recovery-Ireland. Prize-money also grew by 3.9% to €63.5m in 2018. it should be noted, more than 60% of this is sourced from budgetary support. While this annual report is largely positive, Brexit cases a shadow over the (very near) future. The eight "No" votes last night in the UK Parliament means a hard Brexit in early April remains a possibility. 30 years of progress within Irish racing could be undone over night. Chief concerns are centred on the Irish bloodstock industry, animal welfare and the tripartite agreement between Ireland, Britain and France. It remains to be seen how this will be affected in the weeks ahead and it should come as a concern that Aintree 2019 might be the last as we currently know it. While Irish racing successes in Britain have probably never been as obvious, the next two weeks will dictate if this could continue into the future, or come to a crashing halt. As I showed in a post some weeks back here, the average attendance on the opening day last season for the league of Ireland was 2,892. This increased to 3,558 this season. This was good news for the LOI but, as I mentioned, the challenge is retaining fans for the second home game. 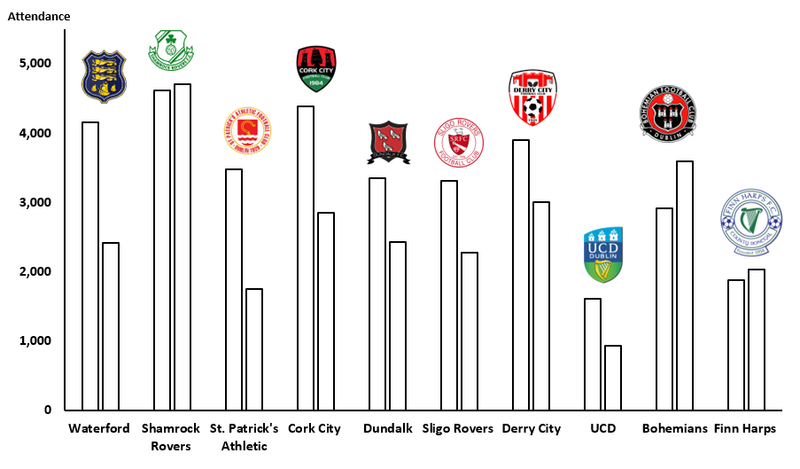 The chart below shows the attendance at the first and second home match this season for each club. While I know there is many moving parts here (day the match is on, derbies, fixture quality, away fans willingness to travel etc. ), we see a drop off for most clubs. This occurred last year and my guess is that it is a recurring effect - many casual fans are attracted to the opening day but, for the most part, do not return. Bohs and Rovers both saw an increase in attendance - both sides had two wins under their belt before the second home match (and Bohs were playing Rovers). Finn Harps were the only other increase. Perhaps being back in the Premier division brings a certain novelty factor.